Say goodbye to your corner church and namaste to the mandir—sales of houses of worship are a window to America’s changing population. In early June, I visited my hometown of Glendale Heights, about 25 miles west of Chicago. Making my way through the old avenues that had marked my childhood, I noticed something curious: The churches that had dominated the street corners of my suburban youth—from magnificent stone structures with ornate stained glass windows to homey, unmarked brick buildings—were either getting demolished or being sold to become Hindu temples. As strange as it may be to see "Gayatri Gyan Mandir" on the outside of a building that could be next to the dictionary entry for "church," it's part of a larger story of the changing demographics of American society. It’s not just in Chicago, and it’s not a unidirectional trend. Synagogues are becoming mosques, Baptists are changing hands with Korean congregations, pagodas are moving into office buildings. The handover in houses of worship across the country is not a straightforward case of an increase in non-Christian immigrants in the United States. In fact, many church sales can be attributed to shifts among Christian denominations. Roman Catholic weekly service attendance has slid from 75 percent in 1955 to 45 percent in the mid-2000s, while Southern Baptist and Evangelical churches have seen big drops in attendance, partially due to a split within the Protestant church between mainline Protestantism and Evangelicals. Meanwhile, Pentecostal churches have seen spikes in attendance. Much of this shift can be attributed to a growing Latino population. Historically Roman Catholic, nearly one in three Latinos today identify as former Catholics. Ex-Catholics tend to veer in one of two directions: they either become Pentecostals or Evangelical Protestants, or they identify themselves as agnostic or atheist. According to Pew Research Center’s 2013 National Survey of Latinos and Religion, only 40 percent of Hispanic Catholics attend weekly services; comparatively, 71 percent of Hispanic Evangelical Protestants do so. Beyond the Christian faith, immigration is shaping the religious landscape of America and influencing the church purchasing process. 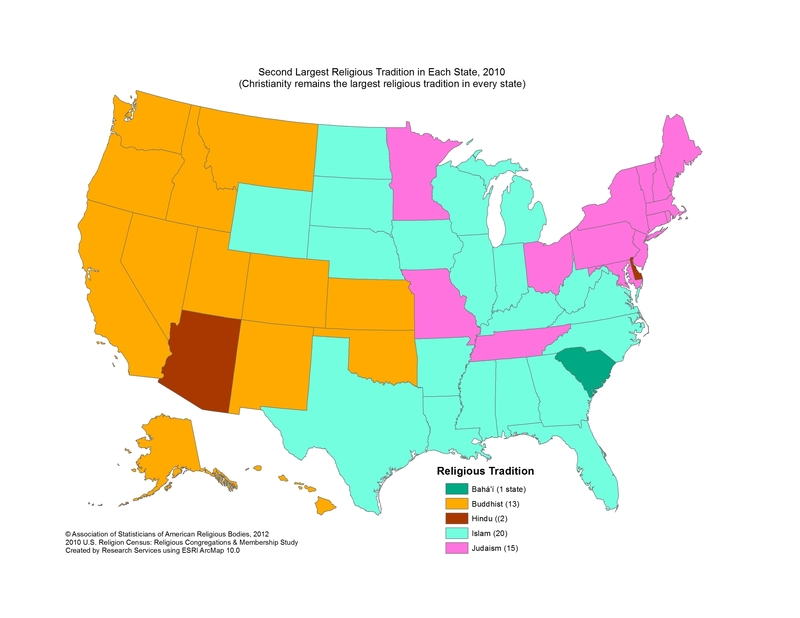 A recent map from the Association of Statisticians of American Religious Bodies of the second most popular religions in states across the country showed that Islam, Judaism, and Buddhism were represented strongly across the country. Though Christianity remains the overwhelmingly dominant religion of choice in the U.S., other faiths are quickly growing, such as Hinduism in Arizona and Delaware and the Baha'i faith in South Carolina. Mary Raphael, co-owner along with her husband Dave of Raphael Realty, knows this. Their southern California realty firm has dealt solely with sales of religious properties for 35 years. Raphael traces the most recent upswing in church sales to the burst of the housing bubble in 2008. While parishioners were struggling with making mortgage payments and impending foreclosures, churches too dipped into their reserves to pay off refinanced properties. But this method sometimes backfired. “So many people were losing their jobs and churches can’t continue for years on their reserves,” Raphael said. “Tithings to churches had declined so much for such a long period that a number of churches used up reserves and refinanced properties. We had foreclosures on churches.” Raphael's observation matches statistics: Giving USA released a recent report noting that donations to smaller churches had fallen by 10 percent during the past year and hadn't yet recovered from pre-recession era donation rates. What made finances more complicated for churches is that banks often don’t like to be associated with lending to religious institutions, fearing it might isolate their consumer base who might not agree with being associated with a religious organization views, says Raphael. This puts churches in a bind: They can’t maintain their properties, and despite wanting to stay open—sometimes very desperately—they end up stumbling into foreclosure. Churches have the added obstacle of legally being nonprofits and requiring a very different legal system than businesses or individuals buying and selling property. The recession fundamentally changed the way the Raphaels engage in business with churches. Though sales of churches has picked up during the recent recession, it's not a new phenomenon. Look to synagogues, says Ellen Levitt, author of The Lost Synagogues, a series of books and tours exploring the changing of hands of the Jewish place of worship to churches, community centers, and schools. Levitt pinpoints the trend of selling houses of worship to other groups to the late 1800s, when Jews were restricted to tenements and built congregations as a way to stimulate community in a foreign land. Today, old synagogues in former Jewish neighborhoods have second lives as many other things, mostly churches—Baptist, Adventist, Pentecostal, nondenominational—though in Queens, for example, they often host non-Christian congregations, too. “There is a former synagogue that is now a mosque,” Levitt said. “At least two former synagogues are now Asian churches, and at least one former synagogue is now a Hindu temple.” Also common: synagogues not becoming a religious establishment at all, instead reinventing themselves as “private residences, non-profit organizations, schools, medical facilities, restaurants or bars… even a museum (the Bronx) and an art gallery (Manhattan)," said Levitt. A similar pattern holds true today in southern California. It’s not just because of immigration patterns—religions are also changing, creating ripples in the church sales market. Christian Science groups, for example, have reported declining attendance. Korean-based Christian congregations have reported spikes in worshipers, while Mormonism is the fastest growing religion in America. But finding a new place to worship presents a dual problem: getting a brand new building for many groups is out of reach, while the smaller churches that are being sold are just too small for growing congregations. Most state rules require that a building be established as a church for fire code reasons, which means buying a house and turning it into a church is off. And parking, particularly in space crunched California, is precious. So what’s a group to do when they want to continue worshiping but can’t afford to have their own space? A popular solution is to share space. An overlooked part of the religious property market is interior design, which plays a surprisingly key role in how religious groups use their space and what types of buildings they’re looking into. Technology has also entered the spiritual sphere, bringing modern worship to the digital age. The latest trend is to have iPad capabilities in seating areas instead of the Bible folder that’s commonly found in pews. The cultural clash that may be expected in selling a building of one religion to another crop up quite often, Raphael says. She recalled an incident where her being a woman was told not only to not shake hands with the priest of the religion but also to remain in the parked car while her husband showed the property. The utmost tenet, however, is to respect the diverse cultures involved in the process.